After months of careful consideration, I’m proud to announce that I am a candidate for the Ward 6 City Council seat on the Democratic Party line. If you’ve attended city council meetings, followed city affairs on local media, or read the Geneva Believer blog in the last few years, you know that I have been an unwavering, consistent and vocal advocate for social, economic and environmental justice, as well as a champion of government transparency and accountability, specifically around issues impacting us in Ward 6. As a citizen journalist, I’ve closely observed and investigated city operations for nearly three years, which has given me a deeper-than-average understanding of the departments, policies, and mechanisms within our city government. Most importantly, I have had the opportunity to meet and work with my neighbors in Ward 6 on a variety of community efforts, and I’ve seen the power and potential of Genevans working together to transform our city for the better. Now, I’m asking you to join me in my campaign for Ward 6 City Councilor. We are renters, homeowners, and working people of all races, faiths, backgrounds and languages in Ward 6, and if we work together, we can make sure that city government serves all of us. Ward 6 needs a councilor that will be aware of what’s happening in every corner of Ward 6, and will always speak up for us. When City Council tried to sell off a piece of Lakefront Park in Ward 6 to developers, I spoke up for us. When Ward 6 residents found out that the DEC and City of Geneva failed to notify them of lead and arsenic contamination in their yards for decades, I spoke up for us. When the wastewater treatment plant accidentally spilled 5,000 gallons of raw sewage into Marsh Creek and Ward 6 residents weren’t warned, I spoke up for us. When the city wanted to put up a “welcome sign” that separated the north end of downtown in Ward 6 from the rest of downtown, I spoke up for us. When the police department did a live “swat raid” training in a vacant house on a weekday when kids from Wards 6 were walking home from school, I spoke up for us. When the city demolished a house in Ward 6 and left the sidewalk unrepaired for more than a year at the same time they demolished a house in Ward 2 and replaced two sidewalks within a month, I spoke up for us. But when I did speak up, the city only responded and did the right thing when we all spoke up together. There are some great things happening in Ward 6. The Solar Home Factory and RealEats have brought and are bringing hundreds of jobs to the ward, including union jobs. Many of our streets (including the long-neglected Clark Street) are getting fixed up and repaved. Neider Park has a new pavilion and basketball court. Lakefront Park, the crown jewel of urban parks in the Finger Lakes, hosts the Geneva Latino Festival, FLX Pride Festival, Mt. Olive Juneteenth Carnival, the Saturday Farmer’s Market, and thousands of visitors every year. Discussions around the connection of Pre-Emption Street to Routes 5 & 20 and the entrance to Seneca Lake State Park are underway at City Hall. Yet, Ward 6 still has bad landlords, high property taxes, high rents, zombie houses, aging infrastructure, the highest rate of poverty of any ward in the city, problems with the relationship between the police and communities of color, and other challenges. On February 12, I had the pleasure to meet with the Geneva City Democratic Committee and ask for their endorsement. After some followup discussions with individual members of the committee, I was told in late February that no other candidates had stepped forward. Late in the first week of March, I was informed that new candidates were being interviewed and that the endorsement decision would be delayed. 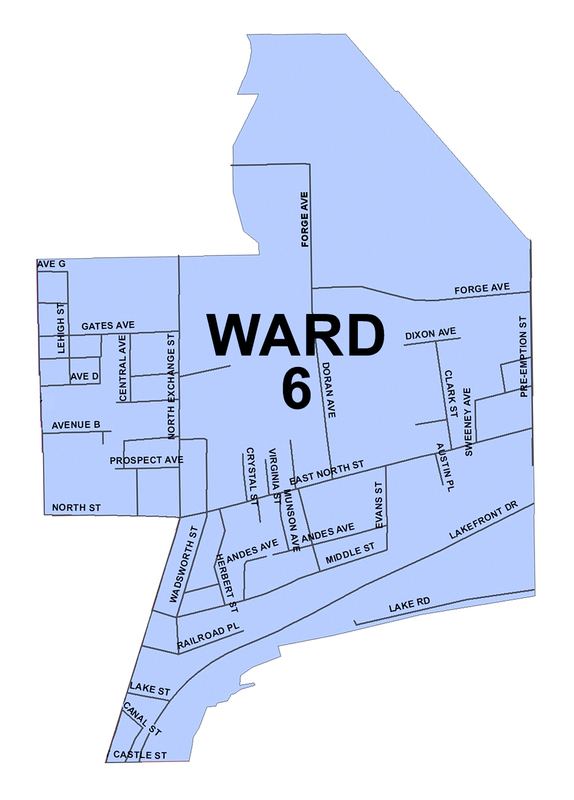 There is currently no one from Ward 6 on the citywide Democratic Committee to help select our ward candidate. While I would be honored to receive the endorsement of the Democratic Committee, the only endorsement I truly need is from the voters of Ward 6, whether in the June Primary or the November General Election, or both. Please visit my campaign website, http://www.meaneyforgeneva.com, for more information in the coming days and weeks.